As our second task, I want to take one of the preset styles and save it in an area where I can work on and alter it. We'll do that and, in the process, illustrate the SAVE, COPY, PASTE, and DELETE options. In the lesson on New Folders, I had located and loaded the DreamyBallad style from the Swing&Jazz category. On the MAIN screen, you can see that it is still the currently loaded style. I am going to save that file on my USB drive. To do that, I return to the STYLE display screen by selecting [D]. It will open at the location of the currently loaded style, which will be in the PRESET area in the Swing&Jazz styles folder. I use the [TAB] key to move over to the USB storage area. In this screen shot, I have moved to the USB area and selected the SAVE option to save the DreamyBallad style. The Name Input Box for the SAVE option opens and the current name -- "DreamyBallad" -- is placed in the Input Box. Rather than saving the file under the current name, I am going to change it slightly to indicate that it will be "my" version of this style. I do that by adding my first initial (j for Joe) to the end of the style name. You can see this modification in the Input box. I am happy with the "new" name, so the next step is to select OK to complete the style save process. I am returned to the STYLE display screen and the style file, DreamyBallad-j, is now saved on the USB drive. Note that it is saved at the root level of that drive and not in the Ballad folder. I could have achieved this same result from the initial STYLE display screen in the PRESET area by choosing the COPY option, selecting DreamyBallad, tabbing over to the USB area, and then selecting the PASTE option. The PASTE Name input box would open and I could alter the name as desired before completing the PASTE operation. I actually want this style in the Ballad folder, not at the root level. So, let's use the COPY and PASTE options to copy the file from the root level to the Ballad folder. First, select the COPY option. When asked to select files and/or folders, select the DreamyBallad-j style as illustrated in this figure. To complete the selection process, press the OK button. Now, move to the Ballad folder, where we want to store the copy of this style, which is now on the clipboard. Pressing the [A] button selects the Ballad folder and opens it. As you can see, there are currently no files in this folder. Since we have copied a file and it is on the clipboard, the PASTE option is now available and I select it. The SAVE NAME input box opens with the current file name inserted. We are not going to change the name, so accept this choice and select OK to complete the paste operation. We are returned to the STYLE display screen within the Ballad folder. You can see the file we copied to the clipboard is now saved within the Ballad folder. We don't need two copies of this file so, now that the file is correctly located in the Ballad folder, let's return to the root folder of the USB drive and delete the copy there. To return to the root of the USB drive from the Ballad folder, select the UP option. This moves you up to the parent directory of the Ballad folder, which, in this case, is the top level of the USB drive. Here you see the original file that we had copied as well as the two folders. Select the DELETE option and, when asked to select the files and/or folders to be deleted, select the DreamyBallad-j style and then press OK. Since deleting anything is a permanent action, you are presented with a confirmation message box that asks whether you are sure you want to delete this file. It shows the name of the file(s) that will be deleted. If this is correct, confirm the deletion by selecting the YES option. This deletes the selected file and returns you to the STYLE display screen. As you can see, the DreamyBallad-j style is gone from the root level directory. However, the copy we made is still in the Ballad folder. We want to modify this style to suit our own preferences. In future lessons, you will learn a great deal about how you can modify any particular style. For now, the next lesson will show you how to make some simple changes in the OTS of the style and then save those changes in "your" version of the style. If you have a PSR-2000 or PSR-2100, or even the PSR-3000, you may want to open the section below to review the original version of this lesson that discussed copying files (and floppy disks) on the PSR-2000. Click on the section title to open (close) that section. First of all, if you have a personal computer and you know how to copy a floppy disk, you can simply use that method to make copies of your floppy disks. If you DO NOT have a personal computer, or one just doesn't happen to be handy, you can still copy a disk in your PSR keyboard. To copy specific files between two disks, say, from disk #1 (let's call this one the "source" disk) to disk #2 (let's call the 2nd disk the "destination" disk), you use a two-step process. First, copy the files from the "source" floppy disk to the "USER" page in the PSR-2000 or PSR-2100. Then, eject the source disk, put in the destination disk, and now copy (or paste) the files from the USER area to the new floppy disk. Detailed instructions are provided below. Step 1: Insert the "source" floppy disk containing the file(s) to be copied. For this example, we will explain the steps for copying one or more Song files. The steps for copying any type of file are essentially the same. Step 2: Press the [A] button on the Main Screen to select SONG. Step 3: Press the [NEXT] button to select the FLOPPY DISK page. Step 5: Select the desired Song file(s) (you can select more than one) using the appropriate button(s) [A] - [J]. In the illustration shown here, there are only two song (midi) files on the floppy disk. One is called "AG-InTheMood" and the other is "RP-Georgia". If you press [A], the first song will be shown in inverse video, that is white letters on a dark background. That means it is selected. Press [A] again and it is no longer selected. To select both songs, just press [A] and then press [B]. Both songs will be highlighted. Step 6: When you choose the COPY option, the bottom of the screen looks like the illustration shown below. If you wanted to select ALL the files, you could press the [6B] button below the ALL option. To copy only some of the files, select your songs, and then press the [7B] button to indicate that it is OK to proceed. Of course, if you change your mind entirely, just press [8B] to CANCEL the copy operation. Step 7: You now want to move the display from the FLOPPY DISK area to the USER area. Press the [BACK] button to move to the USER Song page. 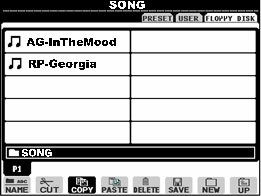 Step 8: Press the [4B] button to execute the PASTE command, which will then paste (another term for "copy") all the song files you selected on the FLOPPY DISK page to the USER page. Step 9: Now that you've copied your songs to the USER page, eject the "source" floppy disk by pressing the eject button on the floppy disk drive. Step 10: Insert the "destination" floppy disk, to which the Song file(s) will be copied, into your floppy drive. Step 11: Now you will copy the files from the USER area to the FLOPPY DISK area. Press the [3B] button to select COPY. The COPY display will appear. Step 12: Just as you did earlier, select all the Song file(s) that you want to copy by pressing the appropriate [A] - [J] button(s). Step 13: When you have selected all the songs you want to copy, press the [7B] button to select OK. Step 14: Now move from the USER area to the FLOPPY DISK area by pressing the [NEXT] button to display the FLOPPY DISK page. Step 15: Finally, press the [4B] button to execute the PASTE command and copy the Song file(s) to the "destination" floppy disk. When you executed the COPY command, you made a "copy" of a file and then moved the selection somewhere else and "pasted" that file in a new location. The original file is not affected. It is still there. If you don't want the file in the original location, you could then use the DELETE command to eliminate that original file. If you used the CUT command to perform the operation, that is, cut out the original file and then paste it in a new location, you could achieve the same result and not have to worry about going back to delete the original file. Of course, if you messed up the operation somehow, you would have neither the "pasted" version or the "original" version. It may be saver to simply copy and then paste. You can then verify that the file is where you expect it to be before going back and deleting the original. It is an extra step, but if you are dealing with a file you would rather not lose permanently, the extra caution will be worth the effort. To duplicate entire disks, the DISK-TO-DISK COPY feature may be used. Follow the steps outlined below. Step 1: Insert the source floppy disk containing the files to be copied. Step 2: Press the [FUNCTION] button. Step 3: Press the [I] button to select UTILITY. Step 4: Use the [BACK] and [NEXT] buttons to select the DISK page in the screen. Step 5: Press the [F] button to select DISK TO DISK COPY. Step 6: When prompted, press the [G] button to select OK. Step 7: When prompted on the screen, insert the destination disk. Step 8: Once you have inserted the destination disk, press the [G] button to indicate that it is OK to proceed. When the screen displays Completed, the process is finished. NOTE: If there is a large amount of data on the disk, the screen may display a message asking for the source disk again, followed by a repeat of the procedures in steps 5 – 7 above.